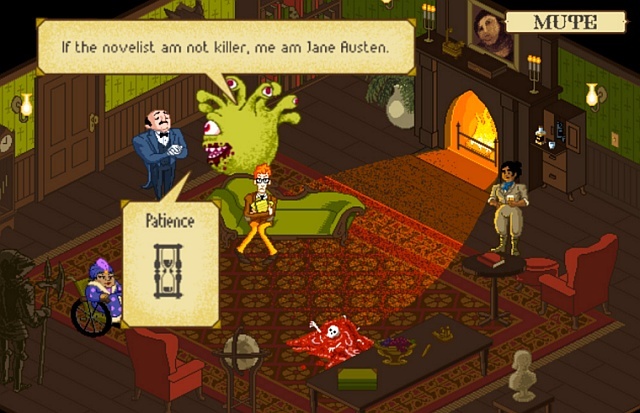 Indie Retro News: The Case of the Mysterious Maulings - Cluedo with style in your Browser! The Case of the Mysterious Maulings - Cluedo with style in your Browser! Developer Description : The good news: you've been invited to a classy dinner party in a stately gothic manor! The bad news: you're a hideous, bloodthirsty monster and you keep viciously murdering people. Avoid suspicion by pretending to search for the killer while framing the other party guests. It's kind of a "Clue" meets "Monkey Island" meets "Doom" meets a dating simulator kind of thing.